Choose from 3 different models: Long, which extends from 50" to 8', Medium, which extends from 30" to 5', and Small, with a rigid 15" handle. All three feature the same 12V battery powered motor to tackle the toughest cleaning tasks. The MS2000L Long Handle model extends 50" to 8', is ideally suited to clean those hard-to-reach jobs such as windows, boats, RVs, swimming pools and more. Assembly required. The MS2000M Medium Handle model extending 30" to 5', provides effortless cleaning of pool decks, shower rooms, bathrooms, kitchens and many other day-to-day cleaning jobs. Fully assembled. 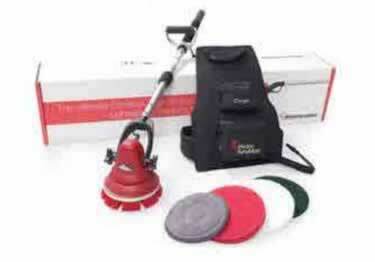 The MS2000M Starter Kit includes everything you need to get cleaning; Medium duty brush, green scrubbing pad, red spray cleaning pad, white buffing pad, microfibre pad, pad holder, harness complete with battery and charger and the medium length handle. Long and short handle kits are also available. TILE&GROUT BRUSH (MS1039TG) - Abrasive brush has grit filaments for deep cleaning tiles, especially ceramics. Also great for restoring grout. DELICATE BRUSH (MS1038) - For scrubbing short pile commercial carpets and stairs before extraction cleaning and painted wooden surfaces. MEDIUM DUTY BRUSH (MS1041) - Non-scratch versatile brush gives a brilliant clean on all internal smooth and textured floors and tiles. FLAGGED TIPPED BRUSH (MS1044) - A delicate brush ideal for dusting air vents. STAIR RISER/BASEBOARD BRUSH (MS1049) - Helps improve hygiene of high traffic areas by reducing dirt and bacteria within a building. Unique brush cleans the uprise and the step at the same time reducing cleaning time. Has the same filaments as the medium duty brush to provide an exceptional clean to all hard floor surfaces, baseboards and corridor edges. ESSENTIALS PAD RANGE - These pads are designed for use in chemical cleaning. Use for all types of hard flooring. BLACK (MS1060): For stripping floor polish; GREEN (MS1062): For scrub cleaning greasy kitchens/floors; BLUE (MS1068): For general floor cleaning; RED (MS1064): For polishing hard and wooden floors; WHITE (MS1066): For dry buffing hard floors; MAROON STRIP PAD: Super abrasive pad designed to dry strip polish without using chemicals. Ideal for restoring many floor types such as vinyl, altro and more. IMPORTANT: Always complete a test patch first. This pad will make the floor go dull, use Twister™ Diamond (MS1069) afterwards to build a shine. HARNESS COMPLETE (MS3114C): Provides total portability allowing you the freedom to clean anywhere. If you plan to work longer than 4 hours it''s recommended to buy a spare harness for 8 hour runtime. The first can be charged while running the second for continuous cleaning. Compatible with MS2000. What's The Run Time? How Long to Recharge? RPM? One speed or Two? What is included with unit? Everything that's pictured? Choose from 3 different models: Long, which extends from 50" to 8'', Medium, which extends from 30" to 5'', and the Hand Held with a rigid 15" handle. All three feature the same 12V battery powered motor to tackle the toughest cleaning tasks. Thank you for your review. We very much appreciate the nice feedback concerning our price and quality of this product. Compact and durable, the MotorScrubber Handy has all the power you need at your fingertips for an outstanding clean. Eliminate frustrating power disconnects of extension cords or power tools. OSHA orange or landscaping green colors. "V" letter shaped brush or chiseled trim with bristles, made out of stiff polyester that makes cleaning fast and easy. Triangularly shaped. Made from stiff poly fiber with a nonabsorbent block for cleaning baseboards, floor edges or molding.